Manchester United continued with their poor recent results, as they have lost their third match in the last four, once again to Wolverhampton Wanderers, but this time in Premier League. It was 2-1 at the Molineaux, even though it was the Devils who scored the opener. Scott McTominay’s fine shot from distance gave the lead to Man United after just 13 minutes, before Diogo Jota equalized halfway through the first half. Ashley Young got booked twice in the span of five minutes before the hour mark, while Chris Smalling scored an own goal in a messy situation when it looked like both him and David De Gea should have done better. The loss gave a big blow to Manchester United’s prospects of finishing in top four. That is still a possible outcome, but after this defeat, the chances are going to be somewhat slimmer. This was United’s seventh Premier League loss this season and they remained at 61 points, now after 32 matches. Man United are in fifth, Tottenham have as many points but better goal difference, while Arsenal are in third with 63. Chelsea remain behind in sixth with a point less than United. However, only United have played their 32nd match of the season, with all of the remaining trio still to play. Chelsea will host Brighton on Wednesday, while Tottenham will open their new stadium against Crystal Palace. Both sides could earn advantage over United in these matches. Ashley Young got sent off too easily in the second half, making a situation all that worse for his team. His challenge for the second yellow was unnecessary and it highlighted once again his poor performance, that was also seen against Watford last weekend. Man United will need to find another option at right-back next season. Fred on the other hand started very well and his opening 25 minutes were good, but after that it was only going from bad to worse. His mistake cost United a goal and he did not offer anything valuable in attack once United needed him to do something. Raul Jimenez joined Wolves last summer on loan from Benfica and he never looked back. The Mexican striker has 15 Premier League goals in his debut season in England and he will be expected to score even more once his permanent transfer from the Portuguese giants is confirmed. This time it was Jimenez’s selflessness that was there for everyone to see. He is a striker who bags goals, but he is not a Ruud van Nistelrooy’s type – he is actually happy to share. He had a lovely assist for Jota’s goal that encapsulated all of the above even better. 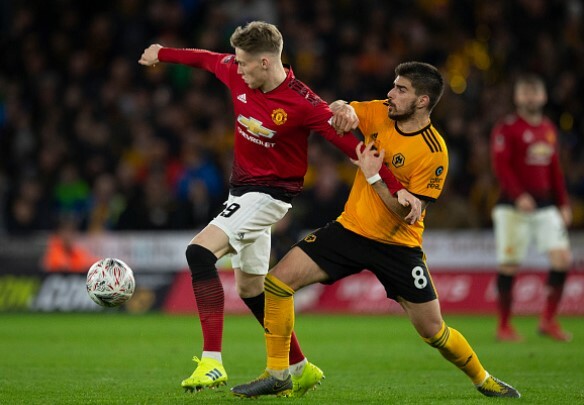 Scott McTominay’s form has been improving in the past month or so and his opening goal against Wolves was the icing on the cake. McTominay made a really nice shot from distance, going for the bottom far corner and the goal was an award of sorts. He did amazingly well against PSG in Paris and against Liverpool he was very important as well. Fred is a waste of space and should not be a united player. Smalling is the worst defender in football. Have united got the right manager?.